. : London Beheading: Bin Hoaxing? Ian comments at TheRebel.org : Could it have been staged? There didn't appear to be much blood around the victim who was dragged onto the street. Applying the Cui bono rule would suggest that we should at least be very suspicious, as only the Government et al will benefit from it. The female aspect of the apparent attempted rescue was also relentlessly pushed by the media. I suspect the motives of this. Given the deception and lying by officialdom over 9/11, 7/7, Madrid, the Boston marathon, and others that regular readers will be familiar with, we'd be stupid not to be wary of the official story. Video showing the shopping-cart woman calmly walking by! This 'spook' is seen here apparently rehearsing his lines. Notice there is no blood on his hands. JimStone : This psy op is so transparently fake I don´t want to waste time going over what others are pointing out, but I have one observation here for others to run with - When the helicopter flies over, you can see blood where they supposedly dragged their victim from under the bushes to the road. That blood is NOT THERE in the videos shot before the helicopter arrived, and ALL video is AFTER they drag their supposed victim into the road. That´s one obvious set up team blooper. In Hollywood, that's what is called a continuity error and they get made all the time in movies, with movie producers trying to keep them down to a minimum in the hopes that no one will notice. BeforeItsNews : UK Soldier Beheaded? Hoax! NWO Terrorist Propaganda! Two men who look like they have been smoking crack drive down a road in Woolwich, South East London, and run down a man. Then they drag that man from where he lay after having been hit with the car and reportedly start hacking away at him with a knife and a meat cleaver. It has been reported that they tried to behead him. 1. Lots of blood where the man was initially hit by the car. 3. The two ‘hackers’ then proceed to interact with the watching public…a huge crowd…even giving interviews, explanations and offering apologies to women for having witnessed the attack. 4. One witness says his mum or his friends mum asked the meat cleaver holding, knife waving, gun toting men if she could comfort the dying man as he passed away….erm, I thought he was beheaded? 5. Since when did the public approach two maniacs with meat cleavers who are hacking away at a mans head and ask if they can have an interview or to ask if they can comfort the man they are hacking to ‘pieces’! 6. As far as I am aware, hacking a human being to death and beheading him would have the attackers covered in blood….yet the attacker giving the interview has blood only on his hands – seems odd. 7. Witnesses in huddle in a huge crowd but only take pictures and speak to the attackers, but no one tries to help? Wtf is all that about? 8. Witnesses run into a nursery asking for help….yet there is a Military barracks a stones throw away but no witnesses ran there…..despite reports that the dead man was a soldier. 9. Armed Police took 20 minutes to arrive on the scene….the attackers are still there, they shoot the attackers….but Armed Police ate stationed less than 1 mile away from the incident at Plumstead police Station? Lewisham Police Station is less than 3 miles away and is lauded as The largest in Western Europe….20 minutes? Seriously? I could call up and claim my old neighbour hit me with his walking stick and they would get to me in 5 min or less. 10. Why is the worlds media reporting this from minute one as a terrorist attack and showing clips of 7/7? 11. Why has Deputy PM cancelled his trip to Germany and Cameron returned from France to hold a COBRA meeting to discuss possible escalation in terrorist attacks? Why are the media bringing out terrorism experts to give analysis? 12. 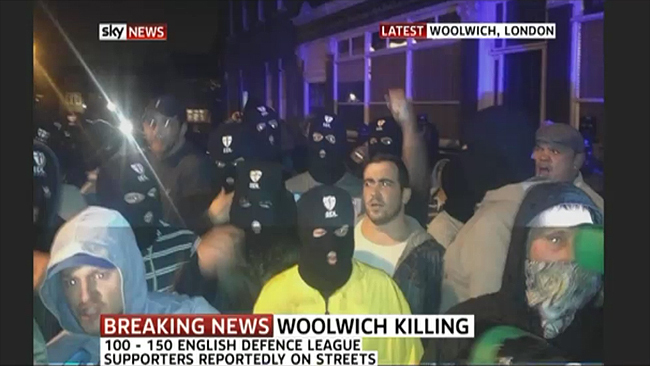 2 men kill 1 man and then give interviews, do not harm anyone else, pictured having conversation with bystanders – yet its global news of a terrorist attack on the streets of London?